A large part of any trip with 20 people is the social aspect. With 40 or more it is still important but there is plenty of room to get away from individuals or certain cliques. It is surprisingly easy to become isolated from the rest of the group of 20. Therefore, a lot of thought needs to be put into “what happens after the river?”. It’s the job of the organizers/committee and social secretaries to keep moral high and, if required, to organize a night of fun and revelry for all. This is common sense, but can be often overlooked, especially in times of high stress. A day trip to a couple of runnable waterfalls was a great way to spend a recovery and chill day. The beginners could bathe in the pool at the bottom, the intermediates could try their luck on their first waterfall, and the advanced guys had fun on some harder rapids. The following days led the group to a different area of Austria where a couple of grade 4 rivers were discovered and paddled, either side of the club paddle, which nicely rounded off the stay in Austria. All in all, everyone was satisfied with what Austria delivered. France had been finalized for a second destination but simplicity was not the name of the game for this alps trip, so a visit to Slovenia was also scheduled. 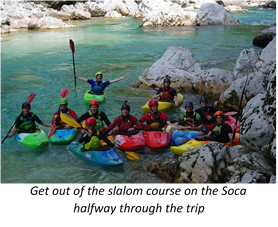 The plan was to leave Austria early in the morning and paddle several sections of the Soca and then drive through the night to France, arriving at the new campsite roughly 24 hours after leaving the one in Austria. A heavy storm, that devastated the campsite, caused a need for committee discussion. One important part of communication is when to communicate information, and who to communicate it with. Having a whole group discussion would have been faff that a sleep deprived team didn’t need. Once it was agreed that Slovenia was still the best option, the rest of the attendees were notified. Controversy came from drivers who had little to no sleep due to the destruction of their tents. However, they agreed the plan was the best course of action because they trusted the committee. This is a key trait, as a committee that has a track record of bad decisions would not have the trust and respect of the group, required to make seemingly reckless decisions. If you do lead a group on a similar trip, you must have the trust of the entire group, but also accept any misfortune that falls on the group directly due to your actions, as your fault. This is a two-way street, and you must trust them to get on board and not cause more faff. One main aspect of a rogue trip with 20 people such as this one is keeping positive and making a flexible, but solid, plan, while silently creating a plan B. Plan A worked and Slovenia was a great success, despite extremely low levels. The remaining time in France saw great progression from all and contained many in the groups’ favourite moments which shows that the southern French Alps still has a lot to give. Including the drive home, there were four out of 14 nights that were either taken up by driving or a storm. This meant that the days were almost all free for paddling, but by the time we got back to the campsite we crashed. Therefore, in terms of paddling, it couldn’t have been a better holiday, but this hindered the social aspect. If the trip could have been longer, we could have perhaps been a bit more relaxed on timings and not sacrificed any night’s sleep; aside from the trip to and from continental Europe that are inescapable. That being said, one of the reasons we didn’t have many fallouts due to lack of sleep, was because everyone had a perfect balance of being relaxed and prompt at the same time. This means that you need to cut faff wherever possible, to the point it doesn’t exist at all. That rounds off the trip, but a couple of months after returning I’m still working out how it all happened and what I learnt from the experience. To conclude, you need a heap of communication, do your research, and don’t leave anything to chance, be on it with time management so there is room for last minute changes, remember it’s a holiday that everyone has paid equally for, balance social and paddling aspects of the trip to ensure a great holiday and progression rate, and finally, keep a plan B tucked up your sleeve for all situations no matter how big or small. This is a lot to ask for, especially for an unexperienced team, but all can be achieved by keeping yourself and the group relaxed and flexible. 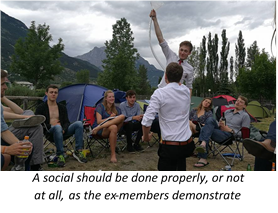 For a full brief of the trip, check out the informal Exeter University Canoe Club news page on their website and marvel at how a series of unfortunate events can be twisted into a holiday of a lifetime. Was it the best university trip in the world? If you tweak and apply this algorithm the possibilities are endless, so probably not. I’ll leave that up to you, to find the answer. This trip would not have had so few hiccups if it wasn’t for a handful of influential people. Firstly, big thanks to Hugh Graham and Matt Robinson for telling me how good Austria was, convincing me to go and giving me resources to make my map with. 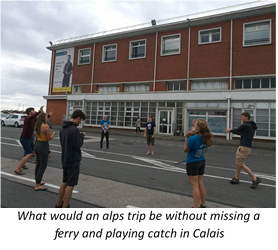 We wouldn’t have been able to run a trip like this without knowing what the levels were like in Slovenia and France on a daily basis, so I’d like to thank Andrew Bonney for updating us (as well as advising before and during the trip) while working for Gene17. Thank you for the constant advice on and off the water coming from a combined 9 alps trips of experience, Sam Rice and Adam Finley. The trip wouldn’t have run as smoothly if the group was lazy and inefficient so I would like to thank all the attendees on the trip. 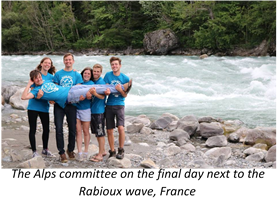 I’d like to give my biggest thanks to the Alps committee; James Dommett, Felix Haigh, Florrie Kirby, Chris McAdam and Emily Swales. A third of this team had never been kayaking outside of England, yet they were still able to organize the trip while in England, manage the ups and downs during the trip while dealing with my constant indecision and generally helped out in all areas, even when it was not in their job description. Finally thank you to everyone who contributed towards the production of this article in some form or another.